It’s certainly not warm enough to go trudging into the Atlantic Ocean, but April is still a great time to hit the beach! We’re officially declaring that it won’t snow again until next November (you’re welcome), so pack up the car and get some fresh air into your lungs— and your dog’s. The reason we like this time of year for taking dogs to the beach is that the beach is much less crowded and you don’t have to be as wary of the heat. Something else to keep in mind is that many beaches are more strict about dogs once beach season really begins after Memorial Day. Depending on your local beach’s restrictions, your next chance might not be until September or October. In addition to being a scenic location for a dog walk, beaches are a great place to do a little puppy training. Since most beaches don’t allow dogs to run off-leash, you’re given a “challenge by choice” opportunity. If you see another dog in the distance, you can keep as much or as little distance as you want in order to socialize your puppy. Walking on sand and taking in the sights and sounds of the beach is a good way to expose your puppy to new environments. Just pay close attention to how your puppy is handling things and be ready to cut the trip short if you feel like he or she is getting overstimulated. Even if the beach near you is dog friendly, you want to make sure your dog is up for this adventure. We recommend that dogs at the very least have on-leash obedience training. Even if you don’t plan on letting your dog off-leash at the beach, having strong verbal control is a good way to be prepared for the unexpected. For example, if you roll your ankle and take a tumble in the sand, it would be nice to be able to call your dog back in a distracting environment! Devereaux Beach (Marblehead, MA): We checked out Marblehead’s website for this beach and were disappointed to learn that they are much bigger fans of CAPS LOCK than they are of canines. NO DOGS ALLOWED! says the man. Duxbury Beach Park (Duxbury, MA): Down in Plymouth County, things are a a bit more dog friendly at Duxbury Beach Park. According to their website, you can spend time there with your dog from 8 AM to sunset in designated areas. 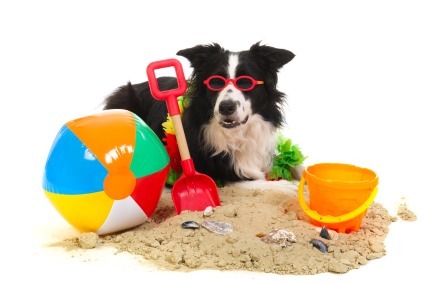 The site says that between April 1st and September 15th, dogs must be kept on-leash for beach season. That seems to imply that as long as your dog has off-leash obedience training he or she can roam off-leash between these hours for the rest of the year. If you want to try that out in September, bring a leash and keep an eye out for any signs saying otherwise. Sandy Beach (Cohasset, MA): It wasn’t easy finding out how this beach felt about dogs, but after searching through their Facebook albums we were able to find a photo of a dog off-leash next to a “Mutt Mitt” plastic bag dispenser. The beach association gently reminded visitors to pick up any droppings, but didn’t scold the off-leash behavior. So if your dog has off-leash training, Sandy Beach in Cohasset seems to be as good a place as any to go for a run on the beach! Salisbury Beach (Salisbury, MA): We were getting mixed signals about whether or not Salisbury Beach was good with dogs or not. We decided to pick up the phone and find out the old fashioned way, and we were told that dogs can be taken off-leash in the riverside portion of the beach and on the main beach and campground until May 1st as long as they’re kept leashed. Crane Beach (Ipswich, MA): This beach is dog friendly but certainly has the most complex rulebook of the beaches we looked at. If you were planning on taking a spring or summer trip to Crane Beach, think again! They are open to dogs registered in their “Green Dogs” program from 10/1 to 3/30. There is a permit required to make your dog a “Green Dog.” It’s free to residents who can show a beach sticker or drivers’ license, but non-residents can purchase one as well. One nice thing about owning a dog with off-leash obedience training in Ipswich is that during the “Green Dogs” season, portions of the beach have no leash requirement. Most of the official websites of state beaches could use a lifeguard who doubles as a webmaster, but if you can’t find out whether or not your favorite beach is dog friendly you can always just call up a town official and ask. Wherever you end up going, just make sure to stick by the letter of the law and clean up after your dog. Making sure your dog is a well-behaved guest is the best way to guarantee that beaches let them come back.